The one on the right, for sure. I like the one on the left. The color, pics and layout are inviting. I think they are both good options, but personally I like the one on the left. I think the logos representing different technology (texting, LOL-speak, Instagram, Twitter, etc) will grab the attention of the parents who feel intimidated by their lack of understanding of those areas. Matthew from Killarney, Manitoba, Canada. I was wondering when someone would vote for one on the left! Thanks for being the brave one! The darker one with the phone. The cover on the right with the iPhone. I like the one on the right–darker background with a picture of an iPhone. The red one just looks like any other book and doesn’t pop out at me at all. I’m going with the red one on the left. I personally like both, but when speaking with parents that are at times a bit clueless, they will understand that better. The one on the right definitely! The left one is android with a very material design feel. The right is more iOS with the organic feel of the wood background and photo feel of the cover… I’m an android guy myself. Definitely the one on the right. The one on the right, definitely! And I meant to add this, but I’m in Denton, Texas! The one that stands out the most is clearly the one on the right. The one on the left isn’t bad, just doesn’t pop as much as the one on the right. Very cool to read a comment from someone in Delaware. I’m originally from lower, slower DE – Milton, near Rehoboth Beach. God bless! One on the right is better. My vote would be the one on the right. If smartphones & their use are the main centerpiece to the book, which the title would suggest, then it makes sense for the iconic smartphone to be the attention grabber on the cover. I really like the one on the left (Red Cover)! I prefer the one on the right! My eyes were instantly drawn to it and I wanted to read the title! Congratulations! Without a doubt the one on the right, with the large iphone on the cover. So much better. Although I like the one on the right, the one on the left will pop out more and be more appealing to moms. The one with the phone, it grabs my attention and explains visually what the book is about better than the plain reddish one. …Although I kind of wish it wasn’t “52” ways. At first that made me think it had to do with a calendar app or scheduling help for busy people, and distracted me from what it is really about. The one on the right caught my eye first. Go with that one! Deanna from Des Moines – oops – forgot to say that! The one on the right. It seems to stand out just a bit more. My eyes were drawn to the picture of the actual phone book cover first. It would be great if you could somehow incorporate the logos of Twitter, Instagram, etc on this book cover because I believe logos can be intimidating for parents and confusing if they are not part of the parents social media world. Finally a reliable source to help me navigate the social media waters. Parents may wonder which logo belongs to which social media and if you do not know it makes you feel dumb and entirely not-connected. Perhaps the logos could be superimposed on the edge of the phone or something? Number 52 really jumps out on this particular book cover as well. Thanks for including your audience in this decision-making process. Another testimony of how you really care about what we think. The one on the right is my preference. Visually it’s cleaner and has a more modern look. The one on the right. Because you are talking about smartphones, it draws your attention to the book. Definitely the one on the right. Agree with the comments to add the various social media logos to it. I’m going with the one on the left with the orange cover for sure. The one on the right is harder to read. I have to look longer to read the info on the cover. God luck! Love the one on the right!!! The one on the right! I definitely like the orange one (on the left) better. I love all of the activity there! LOVE the right one – it is more eye catching to me. Red one on the left looks more professional in my opinion, and a little more “timeless.” The one on the right may seem quite outdated in 5 years. Cover on the right with the big phone! It’ll grab “Big” attention! Way to go Jonathan! I definitely like the one on the right, It looks great, will get people’s attention and is let’s you know that the book is about smartphones even before you read the title. The one on the right with the smart phone. I like the one on the right – feels more contemporary. The one on the right, definitely. Paul Loeffler, Moses Lake, WA. I like the one with the large phone. I prefer the one on the right. I find the title pops better. The right one with the smartphone. This cover really jumps out at you. It looks more “modern day”. The one on the left did not catch my attention at all and appears “dated”. I prefer the one on the right – with the picture of the phone, up against the wood grain. The one on the right, simple and clean lines. I prefer the one on the left, the one on the right is visually appealing but looks like a magazine cover. The left cover has very subtle illustrations that go along way. My vote is the one on the right. Grabbed my attention much better. Seemed clearer regarding the topic of the book. I liked the design. The one on the right with the phone. Easier to figure out what the book is about and a lot of parents aren’t any better then their kids with the phone, it will speak to them as well! I like the one on the right. My son votes for that one too 🙂 He says if you’re in a book store, the phone will catch your eye and you instantly know what the book is about. I am in favor of the one on the right. It has a more modern, catchier appeal. The one on the right caught my eye. I prefer the one on the right for parents. The cover on the left looks more inviting for a teen audience. The one on the right. It makes it clearer that it deals with phones. -the cover in general seems more “current”, with the wood background, etc. I like the one on the right with the picture of the phone. One with the phone, although both look good, I like that one he best. Sorry. To clarify. The One on the right. Lol. Needing a weekend soon. I like the book on the right. The one on the right looks more appealing and catchy to my eye. My initial reaction was the one on the right; but I quickly settled on the one on the left. Who knows how long the current iPhone will be the standard image of a mobile device. If it changes, the cover will make your book look outdated before they even read a word! I like the left option. Better fits the title of the book. They are both good designs, but the one on the right will stand out more when a parent is looking quickly at images and once it has captured their attention, then the content can persuade them to buy it and read it and love it. The one on the left feels a little cleaner. The one on the right ties in better with the theme of the book. Right side looks more enticing to an adult parent. The book cover on the right with the picture of the I-phone caught my eye. Maybe it a sign I have an obsession with screen media. If I were to be walking the aisles of the bookstore the other cover would blend in. If I was just browsing I would probably miss it. The one on the right is the clear winner. The left one looks outdated. I like the one on the left. I have grown weary of pictures of smart phones (everyone’s doing that). The one on the left is attractive and minimizes the phone in the overall scheme of the cover, which seems to be the implied purpose of the book. I like the second cover with the smart phone photo. I think it will capture parents’ attention more if they are looking to cut back their children’s use of cell phone. Love the one on the right. It caught my eye right away. I like the cover on the left better. I like both actually. But the red one on the left speaks more to what the book is about IMHO. Wood background and phone definitely! I’d be more drawn to the one on the right. Although I get the comments in favor of the left one. I like the one on the right. Should have the cellphone on the cover. The one on the right – looks more catchy to me. the one on the right will draw in both the obsessed student and the frustrated and at-wits-end parent. The one on the left looks more “active”. Also, it will stand out more on bookshelves. I like left. The one on the right. The picture of the phone is eye-catching and gives you an idea of what the book is about. 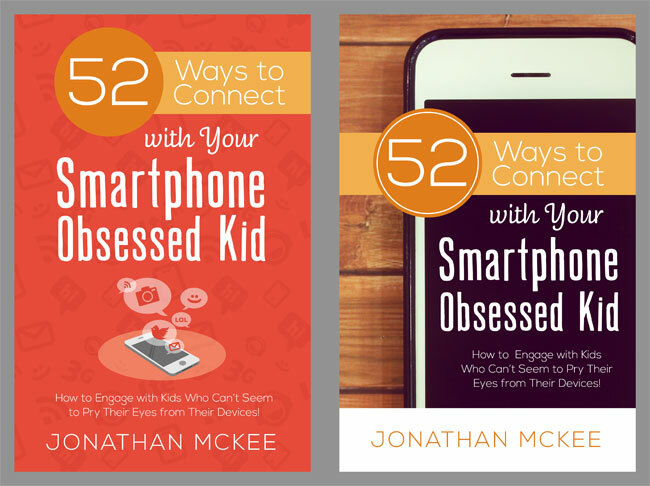 It will stand out if parents are looking for a book about their kids phones. The cover to the right. Picture of phone and the colors used. I like the one on the left, however it takes several moments to figure out what’s happening. The cover to the right takes me a nano second to figure out whats going on and is intriguing. right is the right one for me! Gaborone, Botswana. And yes! Kids are obsessed with smart phones here as well. I like the one on the left Jonathan; it somehow seems more appealing to me. I look forward to getting this book for sure, for myself and to help parents also. Ronald Winters, San Jose, Ca. I would say that one on the left. Before long, the one on the right will look outdated—actually, with the iPhone 6 series, the right cover already looks a year or two old. I have a feeling that it will be more obvious with the iPhone 7 series. I prefer the one on the right (black). The one on the right is my favorite. The white font against the black background stands out more. The image of the phone is more eye-catching. From Cookeville, TN. The one on the right. The one on the left. As a cartoon, it will date slower than an actual image of a current smart phone. That way it won’t look old in 9 months and silly trendy youth pastors won’t scoff at it. The one on the right seems to catch my attention! I like the one on the left – Red Cover – simpler in my opinion. I like the idea of a less is more and Google uncluttered look. Definitely the one on the right! The one on the right is visually more appealing and might grab someone’s attention. The one on the right looks mundane and I don’t know that a parent would know what those icons mean. So…my vote, cover on the right.